In Greek and Roman mythology, Laocoön was a seer and priest of the god Apollo* in the ancient city of Troy*. He played a notable role in the last days of the Trojan Warf and met a violent death with his twin sons, Antiphas and Thymbraeus. Toward the end of the Trojan War, the Greeks placed a large wooden horse before the gates of Troy. Laocoön hurled a spear at it and warned the Trojans not to bring the horse into the city. He said, "I fear the Greeks even when they offer gifts." Soon afterward, the Trojans ordered Laocoön to sacrifice a bull to the god Poseidon*. While he was making the sacrifice near the sea, two great serpents emerged from the water and crushed Laocoön and his sons to death. The Trojans interpreted this event as a sign of the gods' disapproval of Laocoön's prophecy, and they brought the horse into the city, an action that led to their downfall. Hiding inside the horse were Greek soldiers, who opened the gates of Troy at night, allowing the Greek army to enter and destroy the city. Some stories say that the death of Laocoön and his sons was punishment from Athena* or Poseidon for warning the Trojans against the wooden horse. This is the reason given in the Aeneid, an epic by the Roman poet Virgil. According to other legends, however, Apollo sent the serpents to kill Laocoön as punishment for an earlier wrong—breaking his vow to the god that he would never marry or have children. See also Animals in Mythology ; Greek Mythology ; Roman Mythology ; Seers ; Serpents and Snakes ; Trojan War . 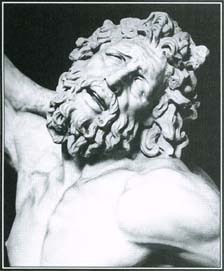 Laocoön was the Trojan priest who predicted the fall of Troy. This ancient Roman sculpture shows Laocoön in his struggle with the serpents that Apollo sent to punish and kill him.